Craving a juicy steak? Get Outback Steakhouse delivered straight to your door. Order burgers, steaks, ribs from an Outback Steakhouse restaurant near you. 10% Off Your First Order. $5 Delivery Fee*. Get Outback Steakhouse delivered to your door! There are streaks, and then there are Outback Steakhouse steaks! 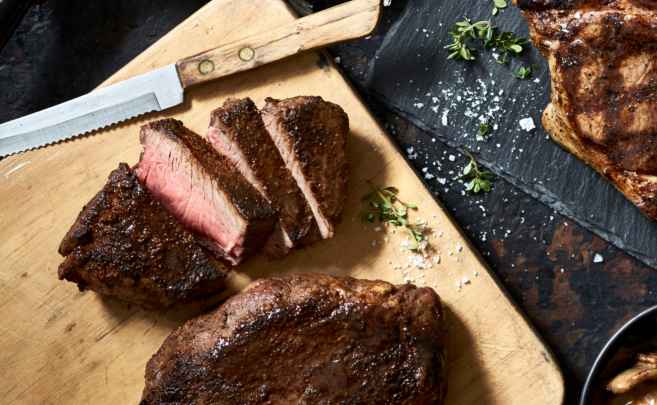 With a commitment to giving their customers the tastiest and best experience, Outback Steakhouse steak are ‘aged’ in a controlled environment to ensure tenderness and are seasoned with a secret blend of 17 herbs and spices. Prepared by chefs who understand the nuances of beef, they are expertly trained to prepare a perfectly grilled steak. It’s how Outback can deliver a great tasting steak, every time. Inspired by the Australian way of life, the seize-the-day mindset is reflected in the Outback Steakhouse menu. Bursting with innovative creations, bold flavors and traditional classics, made fresh. As well as steaks, you can dig into grilled chicken, ribs, fresh seafood and the world famous Bloomin’ Onion. Unless you’re a trained chef, cooking the perfect steak is very hard to get right! Don’t sweat it out when you can order your favourite Outback Steakhouse meals, quickly and easily through Menulog. If you’re in the mood for a delicious dinner fit for the whole family, save the hassle of shopping or cooking and get an amazing meal delivered to you. Use the Menulog app or order online in a matter of minutes.